We swung by a few startup parties last night, and despite the festive mood of the evening, all anyone could talk about was Uber. Michael is in trouble for suggesting Uber should, or could, spend $US1 million on opposition research to dig up dirt on journalists critical of Uber. Uber was also accused of looking at a journalist’s Uber data without permission. At a private Google Ventures party held at its New York office, we sipped seltzer as a group of founders ranted. “Fire the guy! And don’t just fire him, have a ceremony. Make it public. They should invite everyone they know and show this kind of thing is not OK,” a four-time founder said about Emil Michael as he munched down a red-and-green sprinkled cupcake. “Travis is a kid — they need an adult in charge,” said another. “The company seems arrogant and sloppy. I don’t think they are, but they’re making it seem that way and eventually it’s going to hurt them. I don’t think they’re going to be able to fix it unless someone goes. I’d get rid of Emil,” said a fellow founder. 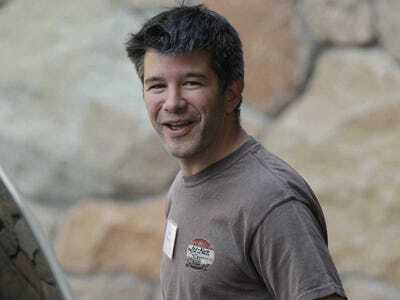 Despite seemingly half of the room being under the age of 25, many commented on how childlike Kalanick has acted in the wake of the scandal. Kalanick posted a 13-tweet apology on Tuesday that didn’t address many of the key questions surrounding the event, which left the media and consumers confused. Firing Kalanick is a bit reactionary. After all, he’s the one who’s led the company to its massive success. Most people are in awe of Uber’s ability to execute. A new CEO might screw things up. So, while the reaction is harsh, tossing Kalanick would very likely make things worse.